In a bathroom, the available space in this typically small area is often irregular. This calls for a bit of creative thinking. One solution is a unit made from a sheet of 12 mm thick plywood (solid timber could be used as an alternative). Use a three ply or tempered hardboard backing. The unit is faced on the top with 50x25 mm batten (finished size 37x19 mm) and with 25x25 mm batten (19x19 mm finished size) elsewhere. Plywood should be of a moisture-resistant type or it could delaminate in the steamy environment. The vertical on the right-hand side could be deleted if preferred. 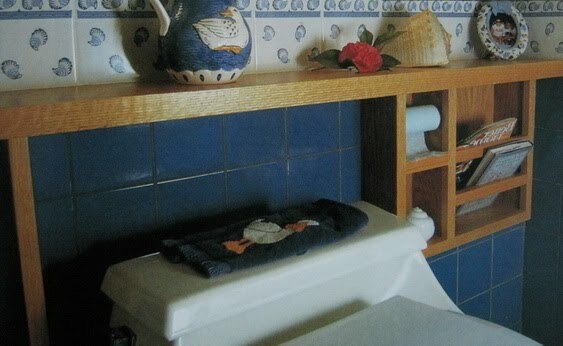 The unit incorporates a magazine rack and a toilet-roll holder but, if the toilet is not the place where you indulge your literary interests, this could be modified to provide more towel and toiletry storage. The unit is nailed and glued together and fixed to the wall by screws and plugs. The unit shown is finished in clear polyurethane and its edging is of Tasmanian oak. It could also look most attractive if made with different materials such as melamine-covered, moisture-resistant particle boards with stained or painted timber edging.